Can Idris Elba possibly get any cooler? If there’s any justice in the world, that will happen when he’s named the next James Bond, but for now he may have hit maximum cool. That’s because the actor from The Wire, Luther and Thor just broke an 88-year-old “Flying Mile” record in a Bentley. Since 1927, the record for the fastest flying mile at the Pendine Sands in Wales has stood at 174.8 mph when it was set by Sir Malcolm Campbell. Campbell was driving a Napier-Campbell Blue Bird race car. This is a Napier-Campbell Blue Bird. The Bentley is probably a slightly better daily-driver. 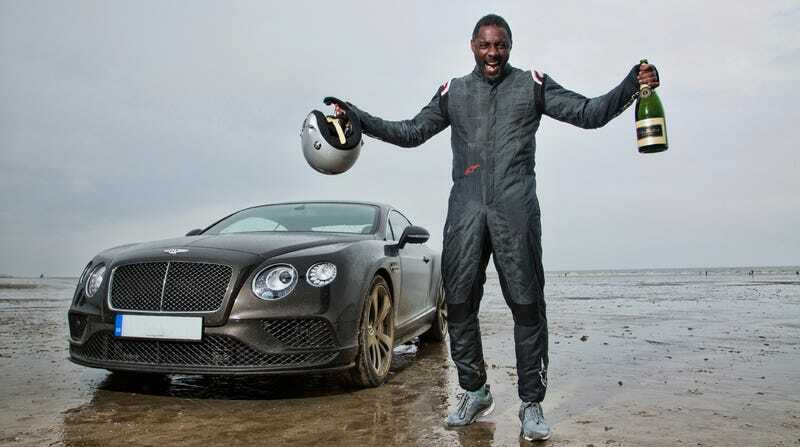 At any rate, Elba, the British actor and noted car guy, just averaged 180.361 mph in a new Continental GT Speed to break the record. The run was done for a new Discovery Channel series, Idris Elba: No Limits, which airs in July. CNN Money says that in the flying mile — where a car gets up to speed before entering a timed zone — Elba hit a top speed of 186 mph in the Bentley, which is seriously not bad on the beach’s wet, tightly packed, smooth sand. Idris Elba is the good kind of celebrity car dude.